The fish were somewhat pernickety some days but those fishers who did consistently well were those who were willing to vary their flies as well as their depth of presentation. On one such day last week tadpole lures were very effective and Sandy Murdoch had 20 fish and Dylan Black had 16 fish on them. 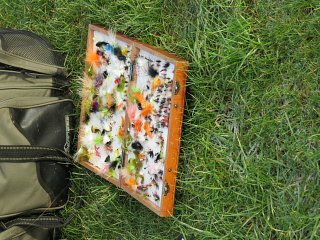 Buzzers, particularly small black ones, seem to be the favourite food source of the Lochter trout and James Brown had 21 fish using a buzzer/fab combination. Pete Green had 17 fish on a buzzer and lure set up, Steve Price had 16 fish on the popular buzzer and diawl bach due and Ernie MacKay landed 15 fish on buzzers and lures. Looking through the returns book – Peter Young fished consistently with the WSW lure and was rewarded with 16 fish for his day session and Stuart Aird on the same lure had 11 fish for his shorter session. Steve Argo And Sandy Carroll were both on the bell with 15 fish each, Sandy using diawl Bachs and Steven on cats whiskers. K west used a wotsit and hopper combination to net 14 fish and Jamie McHardy was always a safe bet on his bunny leech and mini cats set up and he landed 8 fish for his session. The next competition at Lochter will be the Halloween Pairs Competition on Sunday 29th of October. There will be lots of prizes to be won and the entry fee is £20 per person, which includes a fiendishly fancy lunch. Call Lochter Fishery Bothy on 01651 872787 to entre your name.